I recently had a thought provoking conversation with impressive channel leaders at a dynamic company that inspired this blog. 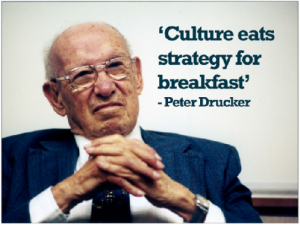 The conversation made me think of the late Peter Drucker’s infamous quote, “Culture eats strategy for breakfast”. On the surface we might think he’s suggesting that a company should focus on changing their culture before implementing new strategy. But after more research and considering the context of the statement, he isn’t suggesting changing culture at all. In fact Peter also said, “Company cultures are like country cultures. Never try to change one. Try, instead, to work with what you’ve got”. So how can we apply this same wisdom to Moving the Channel? Over the last couple of weeks we have spent time discussing and debating the importance of developing a strategy and sharing the playbook with your channel partners. In this same vein, it’s also imperative for your organization to focus its sights internally in order to evaluate the special dynamics of the channel partners’ culture. First, we should recognize and embrace our channel partner’s culture and “work with what we’ve got”. Maybe the cultural differences between your organizations are holding up the partnership and sales. Instead of battling these differences, try to adjust your support, strategies and approaches to fit their beliefs and values. Second, does this present an opportunity to share your winning culture with your channel? We know expecting major changes of culture may not be the best idea, but certainly isn’t influencing it a possibility? Is your company culture a differentiator for you in the market? If so, it could be one of your biggest assets when it comes to creating a loyal partner network and Champions of your brand. Just as many companies fail to include their partners in their channel strategies, so do they also neglect to share their organization’s principles & values with their channel. Invite your channel partners’ Executive Management to a typically internal team building event or a remote brainstorming session. Make sure to spend time not just on your playbook’s X’s & O’s but philosophy and various viewpoints. ROE (Return on Experience) is often achieved when you host your top performing channel partners to a group incentive trip to a desirable destination. While your competition can adjust their strategy, pricing, and partner programs to look like yours, what they cannot so easily emulate is the unique culture of your organization. If your company has a winning culture, it is critical for you share it your channel partners. All else being equal, the right company culture can often make the difference between a reseller of product and a true champion of your brand. Please shoot me a note with ideas and questions. Do you have a story about culture or current culture challenge? I always enjoy the channel community’s feedback and thoughts!